Shop this collection of homecoming dresses and short party dresses for this year’s semi-formal special occasions. The dresses for homecoming in this assortment cover a range of all the hottest styles, including two-piece dresses, off-the-shoulder dresses, high-neck dresses, and fit-and-flare party dresses. 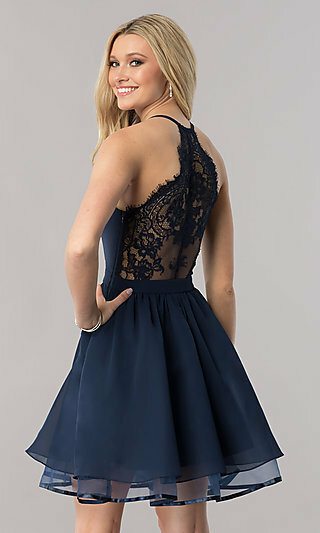 Whether you are looking for bright-colored homecoming dresses, sequined party dresses, or soft chiffon short dresses, there are flirty semi-formal dresses and cute hoco dresses in a variety of colors to complement your personal style. 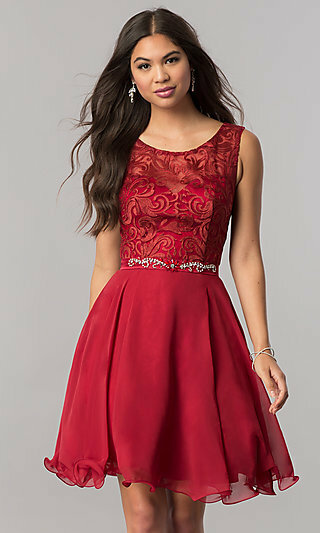 Here you will find many stylish high-quality, yet affordable, homecoming dresses under $100. What Kind of Homecoming Dress Should I Wear? When it comes to choosing a dress for homecoming, most people go for a short party dress in a style they prefer. Whether you channel cute and whimsical, go bold and captivating, or fall somewhere in between, here at Simply Dresses you can find a hoco dress to fit your needs. Short fit-and-flare dresses with floral-print skirts and two-piece party dresses with ruffles provide a youthful style, while v-neck semi-formal dresses with form-fitting silhouettes and homecoming dresses with open backs or sheer waistlines offer an edgy vibe. Your signature sense of style is sure to shine in a chic off-the-shoulder or cold-shoulder dress with a carefree and fun feel. For a charming, sweet look that illustrates a softer side, try a lovely lace dress with beading. Is your style all about glam? Turn up the glitz with a sequin hoco dress, or up the appeal without the extra sparkle in a stylish homecoming dress with a high slit or illusion panels. 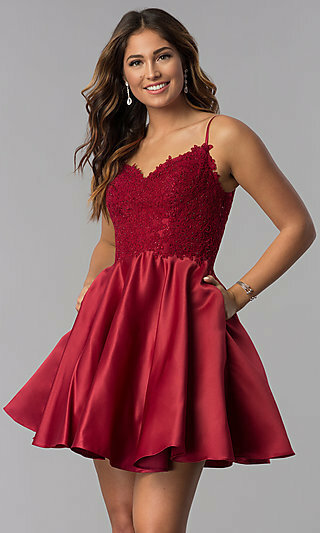 No event is complete without the best hoco dress or short party dress from this collection, so be your confident self in one of these homecoming dresses.